London — Today, Bloomberg unveils its fifth series of Waste Not Want It with a collection of new, original works by acclaimed designers Astrid Krogh, Laetitia de Allegri and Matteo Fogale, Kim Thomé, Lara Bohinc, Soft Baroque, Stuart Haygarth and Tom Price, formed almost entirely out of Bloomberg’s waste. 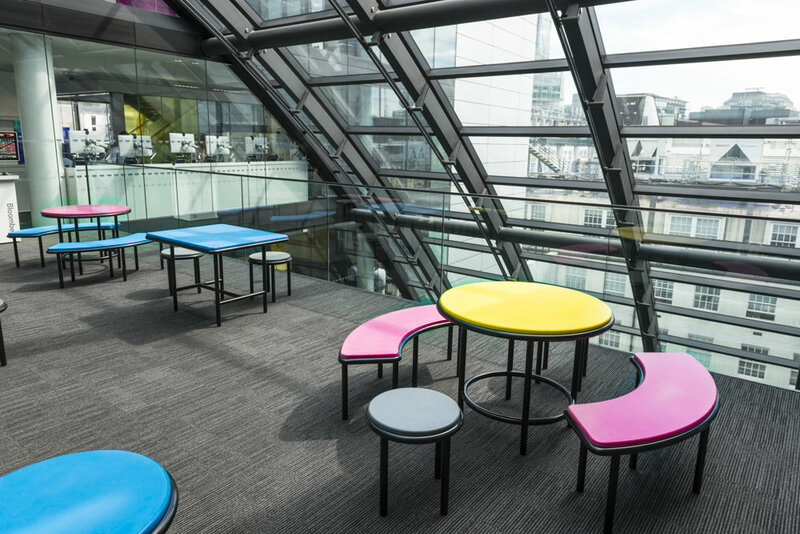 The latest Waste Not Want It installations include lighting, decorative wall panels, seating and meeting areas for daily use by the firm’s nearly 4,000 employees in London. 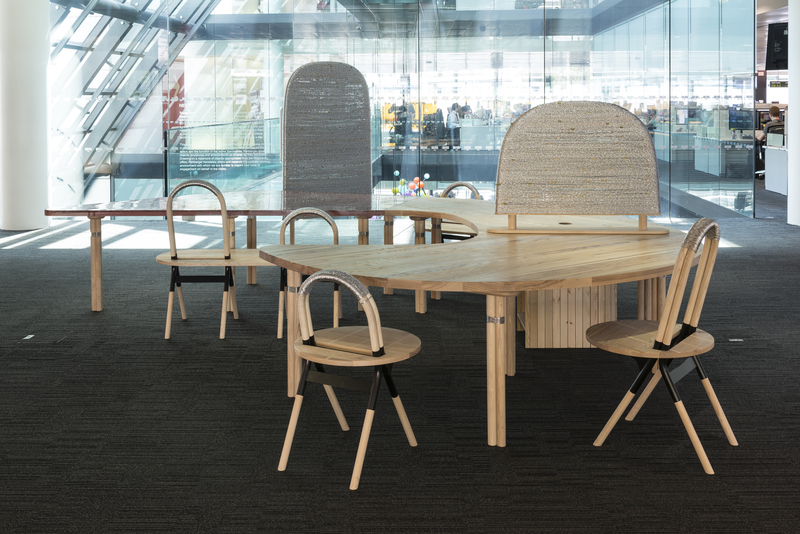 Recycled materials, including 2,000 metres of cable flex, 76 keyboards, 160 holographic screen sheets, 250 printer cartridges and 33 wood pallets, have been creatively reinvented into technically innovative and original work. Waste Not Want It provides a platform for some of Europe’s most dynamic designers and explores innovative ideas about recycling, sustainability and functional design. 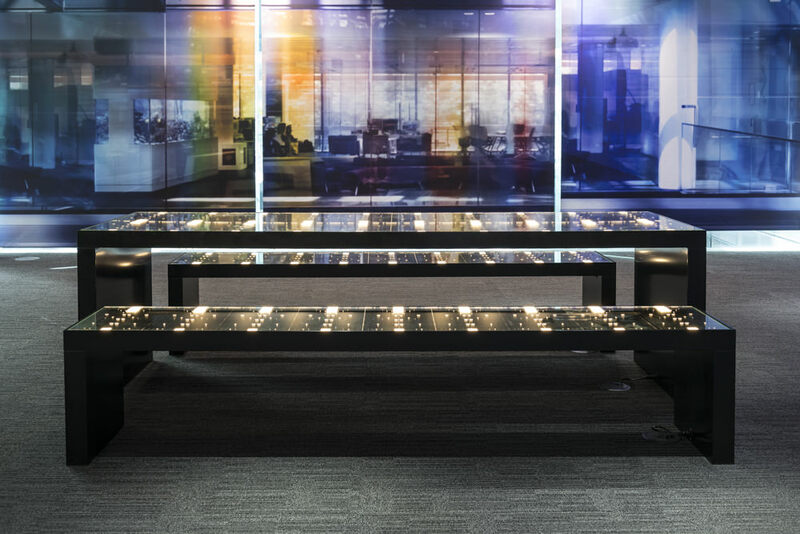 The works evolve in dialogue with Bloomberg employees and often reference the functionality of the hardware and software that powers Bloomberg’s financial data, news and analytics systems. From work made by hand crafted methods to those using sophisticated industrial processes, each designer responds in a different way to the potential and capabilities of the materials. 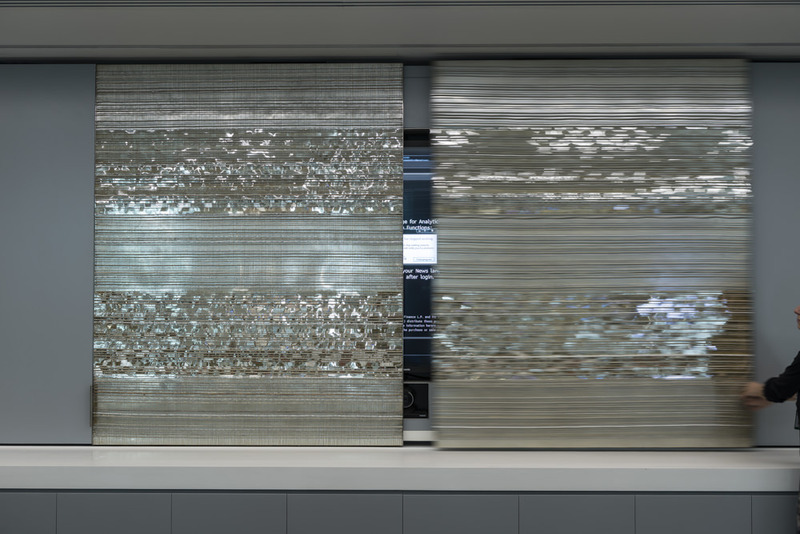 Denmark based Astrid Krogh’s wall screens explore the interplay of light and textiles; she strips 200 metres of cable of its insulated covering and the remaining silver and copper wires are woven on top of layers of highly reflective mirrored foil. Design partnership Laetitia de Allegri and Matteo Fogale also use stripped cables, embedding 1,800 metres of it in a resin table surface along with sections of marquetry from used wooden pallets. Inspired by traditional caning techniques, the silver strands of data cable echo their original function of connecting people. 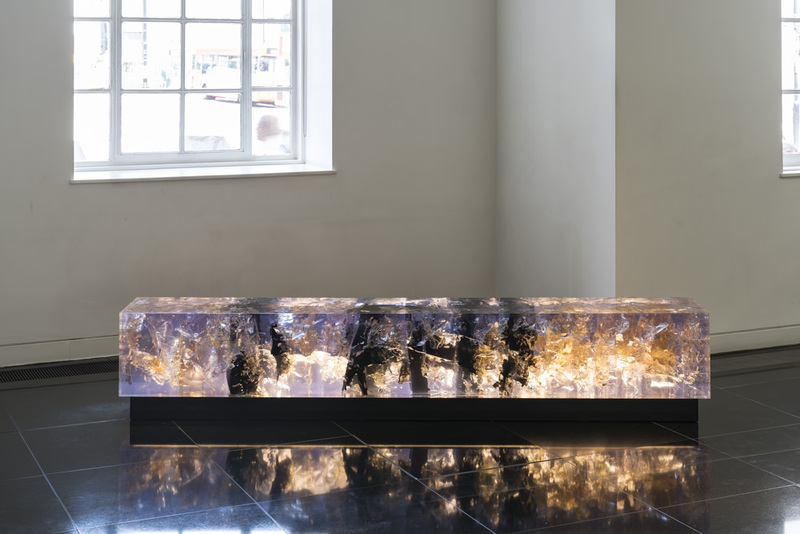 The dialogue between contrasting materials continues in Tom Price’s Synthesis Bench and Light Rods, which are the product of a chemical reaction between resins, tar and residual powder from a used toner ink cartridge, lit from beneath. In every empty toner cartridge, 100 grams of ink powder is wasted. Kim Thome takes wasted powder from 150 toner ink cartridges and mixes the four CYMK colours with jesmonite, a composite material, to create solid geometric surfaces that sit in simple steel seating and table structures. By halving, then halving again the quantities of ink, he controls the resulting colour. Stuart Haygarth and Lara Bohinc excavate holographic sheets from computer screens and perforated steel panels from keyboards to create works both inspired by space. 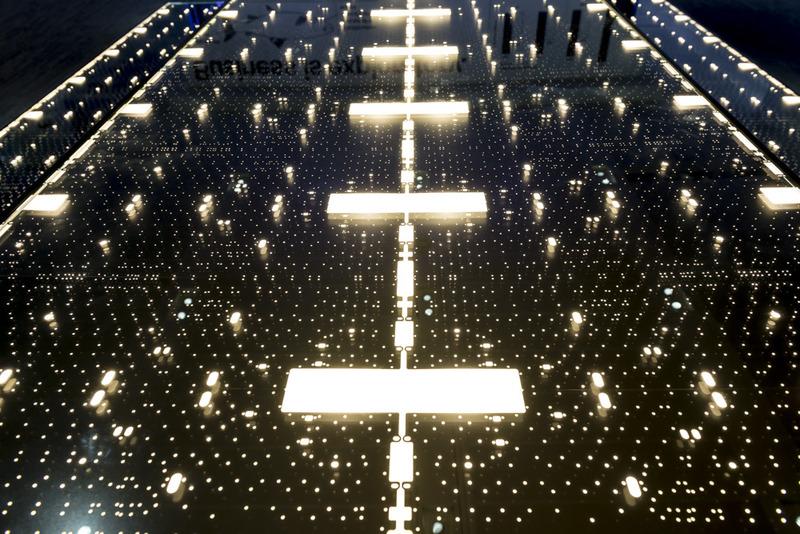 In ‘Starboard’, Haygarth illuminates 76 reclaimed Bloomberg keyboard panels from below with a series of LED lights so that the precisely engineered holes transform into a galaxy of stars and planets. Bohinc sandwiches holographic sheets between quartered glass, edged with steel. 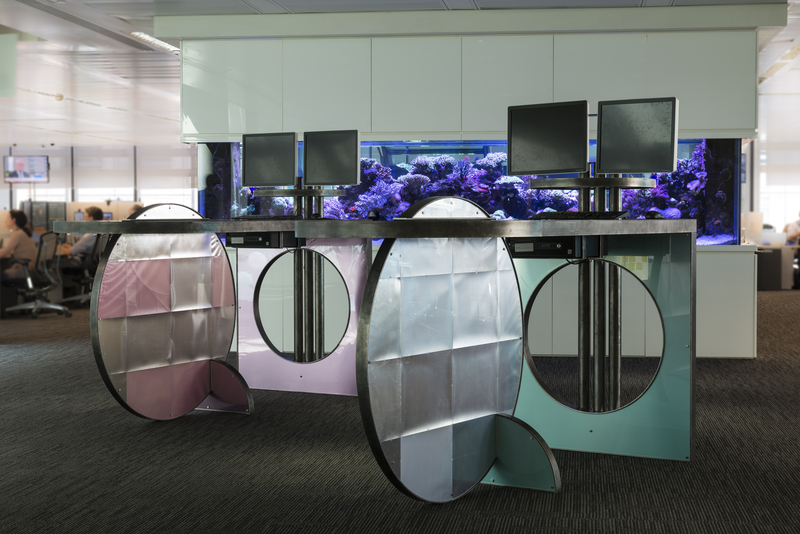 Her ‘Saturn’ tables feature holographic sheets from 160 computer screens and take inspiration from the circular rings of the planet. 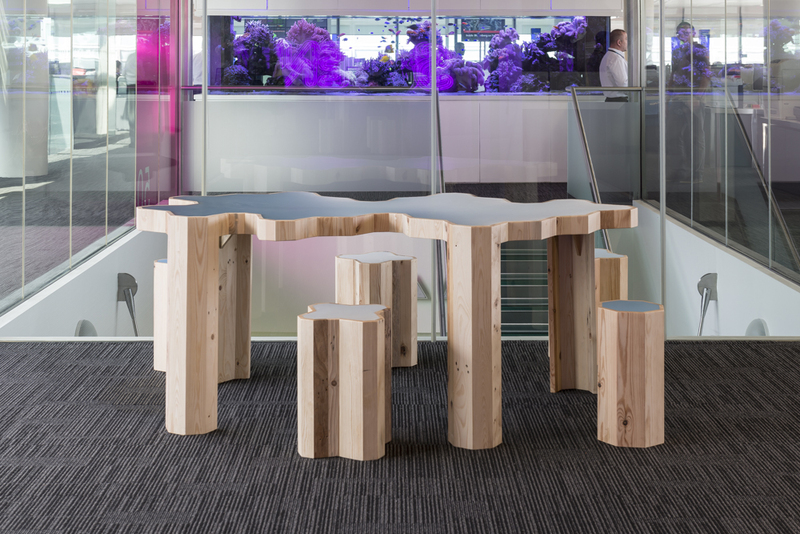 Soft Baroque’s ‘Cloud’ tables are made from pallet wood and filled with poured drifts of resin. Soft Baroque’s tables shaped as clouds are made from pallet wood and filled with poured drifts of resin. The cloud is a suitable metaphor for systems at work at Bloomberg, including cloud computing, connectivity, data migration and ephemeral social structures. Past works from Waste Not Want It have gone on to be re-housed in Bloomberg’s international offices, loaned to exhibitions and re-worked as production pieces. Waste Not Want It V will open to the public on the 24th September during London Design Festival. The pieces will remain in situ for 18 months. Waste Not Want It is commissioned by Bloomberg LP in association with Arts Co. Continuing Bloomberg’s on-going commitment to creativity, education and the environment, Waste Not Want It provides a platform for some of the UK’s most dynamic artists and designers through the commission of unique furniture and art installations made almost entirely out of Bloomberg’s own waste. 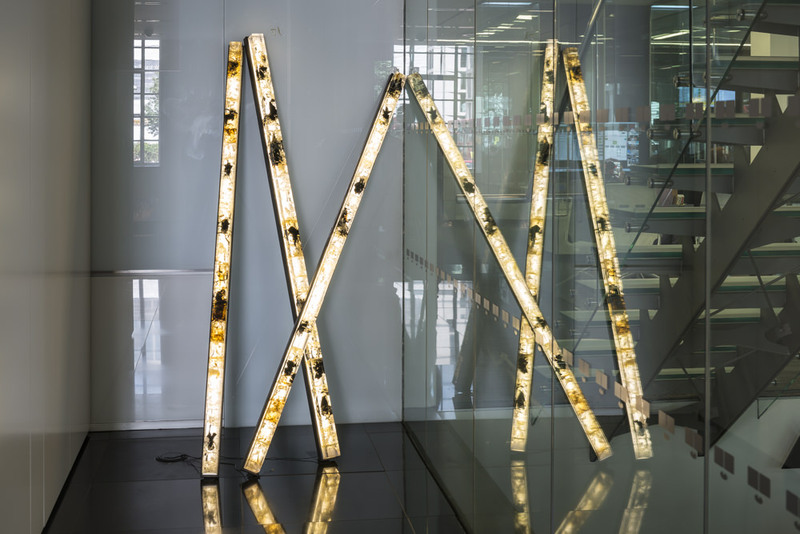 Since 2010, 37 artists and designers have created more than 40 installations for Bloomberg’s European headquarters in London. Bloomberg, the global business and financial information and news leader, gives influential decision makers a critical edge by connecting them to a dynamic network of information, people and ideas. The company’s strength – delivering data, news and analytics through innovative technology, quickly and accurately – is at the core of the Bloomberg Professional service, which provides real time financial information to more than 325,000 subscribers globally. For more information, visit bloomberg.com/company. Founded by Isabella Macpherson and Sigrid Kirk in 2007 Arts Co is a cultural production agency that develops and curates projects across the arts. Kim Thomé – Norwegian born Kim Thomé graduated from the Royal College of Art in 2012 and has since exhibited at A Palazzo Gallery, William Bennington Gallery, 100% Norway, Pavilion of Art and Design (PAD), Habitat and recently showcased for Wallpaper* Handmade in Milan. His works finds a balance between installation and objects, working to blend a mixture of graphic elements and optical play in material and spaces. Lara Bohinc – Slovenian-born Lara Bohinc is a designer who uses her training in jewellery, metalwork and industrial design to make conceptual, eclectic pieces, as well as leather accessories. In the past, Lara has collaborated with brands such as Gucci, Costume National, Lanvin, Exte and Guy Laroche, and has consulted for Cartier International. She studied at the Ljubljana Academy of Fine Arts and has an MA in Jewellery and Metalwork from the Royal College of Art. Laetitia de Allegri and Matteo Fogale is a design studio based in London. Laetitia grew up in Switzerland and graduated in Industrial design from ECAL ‘Ecole Cantonale d’Art de Lausanne’. Matteo was born in Uruguay and moved to Italy where he graduated in Industrial design at IUAV Facolta’ di Design e Arti in Venice. They met in London where for several years worked as designers for internationally acclaimed studios before joining forces to found their own studio and workshop. Their design approach considers honest, premium and un-conventional materials as well as functionality and longevity of the products. Laetitia and Matteo’s work celebrates the combination of industrial process and fine craftsmanship, finding inspiration in nature as well as day-to-day environments. Tom Price – Born in London Tom Price graduated from the RCA and continues to live and work in the capital. Drawing on his training in both sculpture and design, his practice regularly delves into the grey areas between the two disciplines. He has work in major collections and museums worldwide, including San Francisco MOMA, Denver Art Museum, The Nelson-Atkins Museum of Art, the MKG Hamburg, and Amore Pacific Museum of Art in Seoul. Stuart Haygarth – Born in Lancashire, England Stuart attended Exeter College of Art and Design, graduating in 1988 with a BA in graphic design and photography. In 2004, he began to design his own projects using objects he collected from city streets, shorelines, flea markets, and junk shops. In 2007, Wallpaper magazine named Haygarth Best Breakthrough Designer. In 2014 Stuart joined Play, a Solo exhibition at Carpenters Workshop Gallery in Paris, and this year he will take part to “Daydreaming With Stanley Kubrick”, and exhibition at Somerset House, London. Currently, he is working on commissions from Habitat and ABC Carpet and Home to produce customized chandeliers. Soft Baroque – Both Royal College of Art graduates, Saša Štucin and Nicholas Gardner work simultaneously in object design and art. Their London based practice focuses on creating work with conflicting functions and imagery, without abandoning beauty or consumer logic. They have had work shown at V&A, Christie’s, Aram Gallery and Greek Street in London, Swiss Institute in New York, A Palazzo Gallery in Brescia and at Milan, London, New York, Stockholm and Dubai Design Week. Astrid Krogh – Denmark based Astrid Krogh graduated in 1997 from the Royal Danish Academy of Fine Artsworks. She works mainly with textile and light, and the interplay between pattern and texture. The recipient of multiple awards including the prestigious Annual Honorary grant of the National Bank of Denmark 2015, her work has been shown at Malmo Kunstmuseum, Danish Design Museum, Musee Nationale Delacroix, Musee de la Chasse.